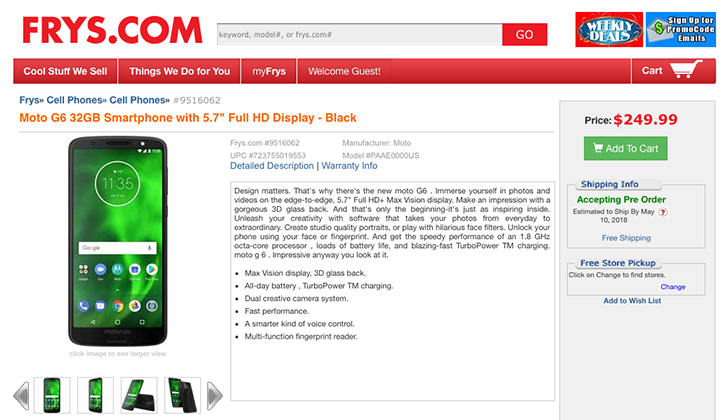 The short-lived Fry's page for the black, 32GB G6 showed that the phone will have a 5.7" full HD display with an 18:9 aspect ratio, 3,000maAh battery with TurboPower charging, and 3D glass back, which is in line with expectations. It was available for pre-order at $249 and had an estimated ship date of May 10th. The page had a lengthy section detailing the camera. It mentioned an 8MP selfie camera with an ultra-wide angle but didn't mention megapixels for the dual rear-facing cameras. Selective focus, face filters, landmark recognition, object recognition, and face unlock were highlighted features. 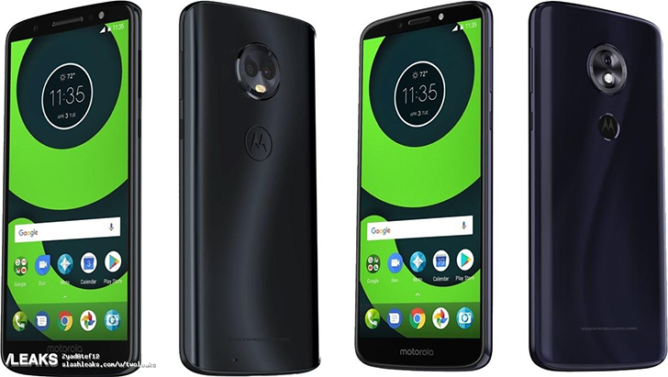 Voice control was also emphasized here, with Moto Voice touted as a helper equipped with natural language recognition that can be activated even when the screen is off. The multifunction fingerprint sensor (a feature I love on the G5 Plus) is located on the front of the phone. The page also noted a Snapdragon 1.8GHz octa-core processor for the G6 but didn't say which specific chipset would be included. Previous leaks point to the Snapdragon 450. There's also a microSD card slot to hold up to 128GB of extra storage. The black, 32GB G6 Play Fry's briefly posted for pre-order shares the same 18:9 display as the G6 but boasts a larger 4,000mAh battery, keeping with Play tradition. It will have a Snapdragon 1.4GHz quad-core processor, but the specific chipset isn't mentioned on the page. The G6 Play was available for pre-order at $199.99 with an estimated ship date of May 17th. A "rapid-focus" 13MP rear-facing camera and 5MP selfie camera were highlighted. The fingerprint sensor is moved to the back of the phone, which makes for a subtle cosmetic difference from the G6. There's a microSD card slot here too, which can hold up to 128GB of extra storage. There are also new press renders for the G6 and G6 Play available, thanks to SlashLeaks. No obstructions this time around. This isn't anything we haven't seen before, but these renders are the clearest ones yet. As before, you can spot the "motorola" branding at the bottom of the front, whereas the G5 family had "moto" branding at the top. You can also see the dual rear-facing cameras on the G6, as well as the rear-mounted fingerprint sensor for the G6 Play. SlashLeaks also shared specs for the G6 Plus: a 5.93" FHD+ display, Snapdragon 630, 6GB RAM and 64GB of storage, a 12MP/5MP dual rear-camera setup, a 16MP selfie camera, a 3,200mAh battery, and Android 8.0 out of the box. This confirms leaked info we saw in January. 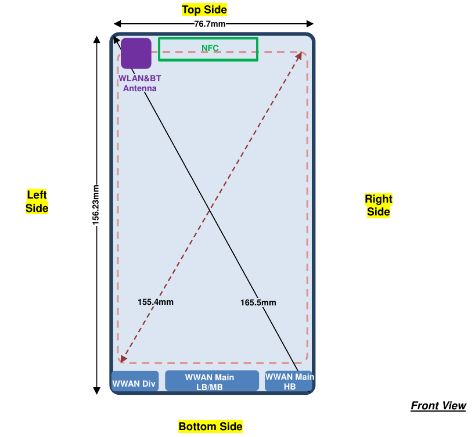 The Z3 Play is making its way through the FCC, and recent filings reveal that the phone (model number XT1929) will have the Snapdragon 636 (SDM636). The Z3 Play nearly mirrors the Z2 Play with regard to LTE bands, though the North American version adds bands 14, 18, 19, 40, and 71. Band 71 is the most notable addition, as it will support T-Mobile's new 600MHz LTE. The Z3 Play will come in two storage variants: 4GB of RAM with 32GB of storage, or 4GB of RAM with 64GB of storage. The availability of those versions will vary by region. Dual-SIM versions of the phone will be available only in Mexico, some parts of Latin America, Brazil, and APAC/EMEA. The phone will have a 6.1" display and will be just a hair wider than the Z2 Play. Given the nearly identical chassis, a battery with capacity around the Z2 Play's 3,000mAh is a reasonable expectation. We now also have a much better idea of what the Z3 Play will look like. 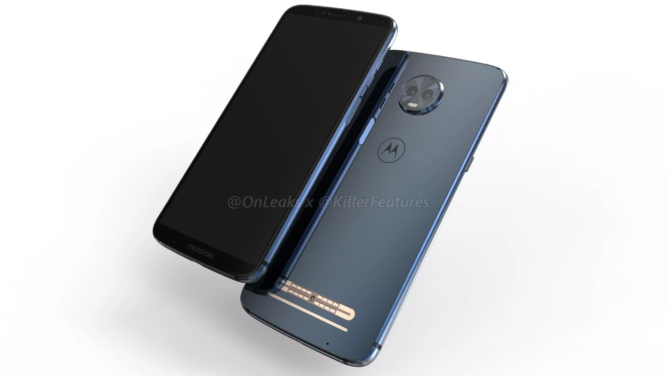 3D renders and a 360-degree video from @Onleaks given to KillerFeatures show a form factor similar to the Z2 Play with some subtle differences, including the move of the fingerprint sensor to the right side of the device. Let us know what you think of these phones and the new details about them in the comments below.